Top earners also face more tax and all National Insurance contributions will rise, he said in his pre-Budget report. Mr Darling said "exceptional measures" were needed with the economy set to shrink next year - but the Tories said he had "mortgaged" Britain's future. Alcohol, tobacco and petrol duty rises to offset the 17.5% to 15% VAT cut. Shadow chancellor George Osborne, for the Conservatives, accused Mr Darling of "bringing this country to the verge of bankruptcy" by doubling the national debt, which is set to reach £118bn next year. Mr Osborne accused the government of creating "a huge unexploded tax bombshell timed to go off at the time of the next economic recovery". He said Mr Darling had offered "temporary tax giveaways paid for by a lifetime of tax rises on the British people" and he said the country's future had been "mortgaged to bail out the mistakes of the past". Lib Dem treasury spokesman Vince Cable said VAT cuts would not be enough to boost consumer spending and "it would be much more sensible to put money directly in the pockets of low paid workers by cutting their income tax". In his Commons statement, Mr Darling slashed economic growth forecasts for next year from 2.75% to between minus 0.75% and minus 1.25% - the biggest downward revision on record. But he said the government would inject an extra £20bn into the economy, or 1% of GDP, in a bid to get it moving again funded in part by an extra £5bn in efficiency savings and a big increase in government borrowing. There would also be a dramatic cutback in government spending - with it being projected to rise by just 1.2% a year, less than the normal growth rate of the economy and down from the already tightened plans for 1.8% spending increases. The most expensive stimulus measure is a temporary cut in VAT from 17.5% to 15% aimed at getting consumers spending again. Mr Darling says the cut - which comes into effect on Monday in time for the peak Christmas shopping period - will put £12.5bn into the pockets of consumers over the course of the 13 months it will last. Pensioners will also be given a one-off payment of £60 - £120 for couples - in January on top of their £10 Christmas bonus. But the rise in duty on alcohol, tobacco and petrol, to ensure they do not benefit from the cuts in VAT, will be permanent. And in measures aimed at clawing back the VAT cut and other measures, top rate tax will increase to 45% from 2011, for people earning more than £150,000 a year and from April 2011 all rates of National Insurance (NI) contributions will be raised by 0.5% for employees and employers. The starting point for NI will be brought into line with that of income tax so that no-one earning under £20,000 would pay any more contributions as a result, the chancellor said. On borrowing, Mr Darling said it would be "perverse and damaging" to stick to government rules in the current crisis so they would be temporarily suspended. Government borrowing would more than double to £78bn this year and £118bn next year, before starting to come down, with the books not to be balanced again until 2015/16. "If we did nothing we would have a deeper and longer recession that would cost the country more in the long term," Mr Darling told MPs. "In these extraordinary circumstances allowing borrowing to rise is the right choice for the country." He added: "Taken together these steps will ensure that there is extra money flowing into the economy when it is needed most, but we can reduce borrowing when growth returns." In other measures, Mr Darling speeded up the introduction of planned rises in child benefit and measures aimed at helping small businesses hit by the credit crunch. And he softened the blow for drivers by announcing a more gradual introduction of new vehicle excise duty, with rates only going up £5 per vehicle in 2009. Work to upgrade motorways, refurbish schools and repair council houses is also to be speeded by bringing forward £3bn of state spending. And there will be more help for home owners, with the scheme which covers mortgage interest payments for those who have lost their jobs doubled to cover mortgages of up to £200,000. This year's increase in the income tax personal allowance of £120 a year for basic rate taxpayers will be made permanent and increased to £145 in April, helping 22 million basic rate taxpayers - another 500,000 households not just this year but for good. The 45% top rate will not come into effect until after the next general election, meaning Labour will not break its 2005 manifesto commitment on not raising income tax. 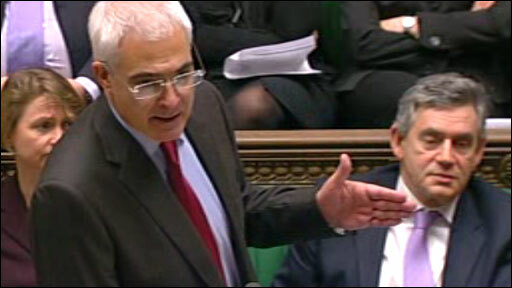 Mr Darling's Commons statement heralds the biggest shake-up of Labour's economic policy since it came to power in 1997. Giving his reaction to the Pre-Budget report, the SNP's Treasury spokesman, Stewart Hosie, said: "We welcome the VAT cut, the vehicle excise duty changes but question why on earth he wants to put petrol up at this point." Plaid Cymru's Adam Price said Mr Darling's stimulus package did not go far enough and did not offer "the kind of economic leadership we were hoping for". The FTSE 100 Index of leading shares rose by a record 9.8% or 372.1 points at 4153, although market watchers said this was largely down to the rescue of banking giant Citigroup which helped ease some of the uncertainty seen the previous week.